What are the ski conditions like right now at Windham Mountain? Read commentaries and see photos from fellow skiers and riders sharing their on-mountain experiences. Check back daily for new user-generated firsthand reports from Windham Mountain to see ski conditions, new snow and general stoke from the slopes along with images. Firsthand reports are submitted via the OnTheSnow Ski & Snow Report App. Download the free app to be part of the conversation. Loose granular coating the ice base. Skied off everywhere by noon. Typical Windham conditions. Double blacks were skating rinks all day. Another magnificent bluebird day after a rainy night! 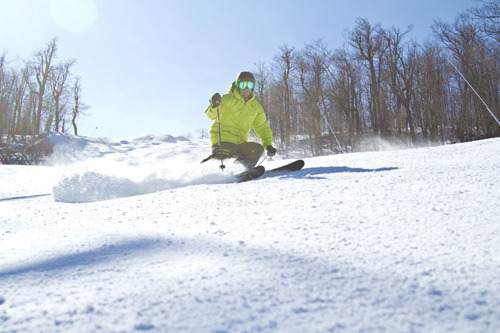 Warm temperatures, intense sunshine, beautiful corn snow. Kudos to the grooming crew. Pretty good conditions. Busy but I’ve seen this place more crowded before. Lines long but moving pretty quickly. Friday really was spectacular! Great snow, beautifully groomed. Off to a cold start, but warmed for a glorious bluebird day! Never had to request refund on lift ticket before, but I guess there's a first time for everything, and that was today, 1/27. They were making snow all day yesterday and had ample opportunity to get decent coverage at the top and yet the crew seemingly took the night off, because the whole top of the mountain was an icy disaster. They didn't even fix the sheet of ice getting off the new 6-pack lift. And whether it was clusters on the mountain or chaos in the lift line, the staff is out to lunch. Was there 1/26 and it was pretty icy all over. Just a thin layer of fake which all got skied off later in the day. Consistent temps below freezing along with some significant real snowfall is needed to get things back to where they should be.